SNES Umihara Kawase (JPN) "sightseeing" in 13:15.12 by BobWhoops. Umihara Kawase (海腹川背) is about a schoolgirl with a bag of holding and a rubber fishing line setting out to rid the world of giant mutant fish. This video plays the longest path of the game having only two bosses, aka. Bob's path, which you can find at the Field Map page. 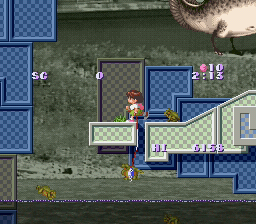 The Umihara Kawase page has more information about this game. The boss levels are quite long in this movie ― they can't really be sped up, but the author of the movie has done his best to make it worth watching. No frogs were harmed in the making of this movie.